"As soon as we got it out from under the tree," says Holzbauer, now a 32-year-old attorney in Madison, Wisc., and the organizer of the world's largest Tecmo Bowl tournament, "we played it the entire day. My mother, I can still hear her saying, 'Gary [their father] the boys aren't doing anything except playing this stupid video game.'" Twenty years later, sports video gamers can't stop playing this stupid video game, the one borne of endzone-to-endzone on-the-fly touchdown passes from "QB Browns," Christian Okoye stunning and flinging off defenders like kernels of popcorn, of course, the immortal Bo Jackson doing the "Tecmo Weave" for a 100-yard touchdown. Tecmo Super Bowl turned 20 on Dec. 13. For all of its quirks, exploits, and cartooned shortcomings, Tecmo Super Bowl is the progenitor of modern simulation sports video gaming. The original John Madden Football featured 11 players on each side. The original Tecmo Bowl, from 1989, had only nine, but they were still players from the real-world league. Not until Tecmo Super Bowl did a football game, or any sports video game, feature a complete league with fully accurate names and rosters, licensed by the league and players it sought to emulate. That means the Dallas Cowboys that Chet played with on Dec. 25, 1991 reflected the team, in names, colors and symbology, that went out and beat the Chicago Bears 17-13 four days later in the first round of the NFL playoffs. Today, we take this for granted. In that time, it was unprecedented. That's partly why Holzbauer's Tecmo Bowl tournament, scheduled for its eighth meeting on March 3, 2012 in Madison, draws a 128-man field with dozens of alternates from around the nation. Even if the entrants are NFL apostates or paunchy dads who haven't owned a gaming console since they left home, there's still a burning feeling, that has glowed ever since their dorm room or frathouse days, that they know all of the teams and all of the players in Tecmo Super Bowl better than the ones from this year. Haddix's video game persona is one of the vestiges of video game design when sports titles were run by people who knew very little about the leagues they simulated. Tecmo Super Bowl, remember, was coded in Japan before the days of the Internet. Haddix played for Tampa Bay, a terrible team in 1991, but by the record books available to Tecmo's programmers, had an outstanding 1990. He intercepted seven passes, returned three for touchdowns, and went to the Pro Bowl. That was enough for Tecmo make him one of the best defensive backs in the game. If you're playing Tecmo Super Bowl for bragging rights and your adversary picks the Wayne Haddix Buccaneers, an awful 3-13 team that year, you had better not select the 12-4 Denver Broncos with Hall of Fame quarterback John Elway.Why? "Pass accuracy does absolutely nothing in this game," Knobbe said, though the rating appears to boost a quarterback's overall score, making Elway one of the three best quarterbacks in the league. Modders have figured out that "pass accuracy" is a total phantom stat in Tecmo Super Bowl. Passing control—and how that differs from "accuracy" who the hell knows—is the operative statistic, and there Elway is a Favretacular 44 overall. Sam Graddy is so fast, competitions must stipulate the Raider benchwarmer can't be inserted at running back. Holzbauer has another secret weapon lurking. "Sam Graddy," he says, of the Raiders wide receiver. Even on a team with Hall of Famer Marcus Allen and Bo Jackson—the undisputed greatest video game athlete of all time—Sam Graddy was actually the fastest Raider in Tecmo Super Bowl. Knowledgeable players go into the game and swap him for either of the starting running backs. He is so fast that competitions, such as the one Holzbauer organizes, must make "No Graddy" stipulations. Even at 20 years old Tecmo Super Bowl remains current. Knobbe and his community at TecmoBowl.Org have annually published an updated modified Tecmo Bowl ROM, accounting for all of the current teams in the league (even the four added in the two decades since), their players, and updated helmet colors and graphics. Knobbe himself, and others, pump out smile-inducing Tecmo Super Bowl videos that recreate great plays from the real world league—such as this one from Marshawn Lynch's "Beast Mode" run in last year's playoffs. This winter, Knobbe and his community's mad genuises will assuredly put out more highlight videos. This March, Holzbauer's tournament will crown a champion. In a field hailing from more than 22 states, he will at least be the American Tecmo Super Bowl champion, if not the World Champion. 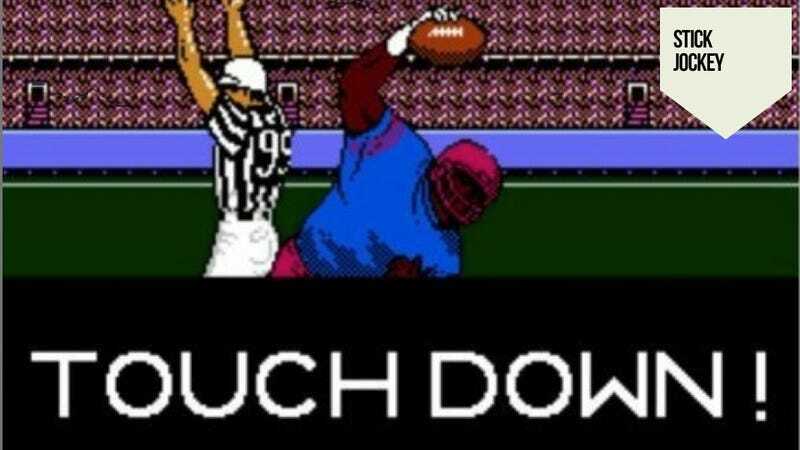 But the key to Tecmo Super Bowl's enduring relevance and playability is not the fact it can be adapted to the modern league or to sports bar competitions. It is still the same score-settling, arm-punching, gift-wrap rending, dorm-room fighting foofaraw it was 20 years ago. "It has the hallmark of any great game," Knobbe says. "It's very simple to play and learn, but hard to master. Even if you play a thousand games, you might see something completely different in game 1,001."